Hello everyone! There will be another Wizard Jam in December! If you're new to the community, Wizard Jam is the community-run game jam we host twice a year. 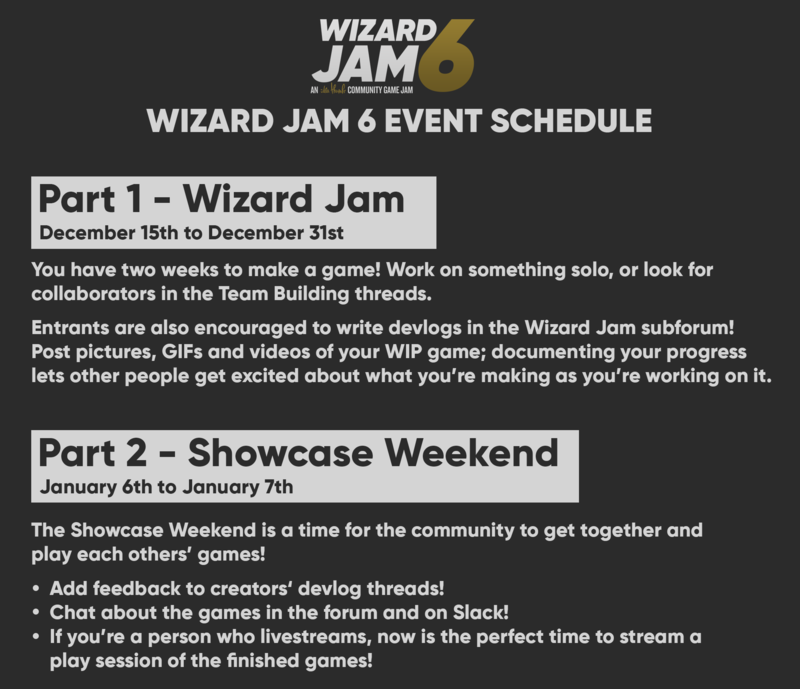 Wizard Jam is not a contest; the main emphasis is to celebrate the Thumbs community through sharing and collaboration over the course of a fortnight. We write devlogs and post GIFs. We offer support and volunteer music, sounds and other assets. We play each other's games and stream them. It's a lot of fun. The other thing we try to emphasise is encouraging people to try making something new and unfamiliar; or to try game development for the first time entirely (quite a few of the entries we've had in the past are from complete first-timers to gamedev!). We run the jam over the course of two weeks to give people the room to try something weird and see how it turns out. The diversifiers are an optional challenge for the jam. They're creative prompts, designed to help you design a game around a specific limitation (or set of limitations). You can choose as many (or as few) as you like and incorporate them into your game. This jam is not a competition, and there is no minimum level of game development experience needed to join. People from all backgrounds are welcome to participate. If you're new to gamedev, let us know! Join us on the forums and on Slack; where you'll find help, advice and encouragement from the community. Entries containing any form of harassment or hate-speech are not permitted. Anything crossing into this territory will be removed. Use this subforum to make development log threads, recruit folks, and chat about development related stuff! There's also the game development subforum and the #wizardjam slack channel. If you aren't a already a member of the slack group and would like an invite, send me a private message at @zerofiftyone and I will make sure you get access. After the jam finishes, we'll be hosting Showcase Weekend; an opportunity for everybody to step back from the game making process and look at what everyone else has made; with an emphasis on giving feedback and comments to fellow creators. It's covered in the schedule below, and there'll be more details to follow. Nice! I think I will have time to take part this time. I make my biannual return to say yes, and yes again. If ever I was motivated to finish my current project, it is right now. Hey so it really bugged me that the pause jingle bells didn't loop quite perfectly. So here's a better (?) fully loopable version in case you actually want it to be in your game and looping. We need all the usual asset-sharing and team-building threads up! I really don't think I'll be around to do anything this jam - unless I find a couple of days to cobble something together - and perhaps not even to play through as many of the entries. But I'll try! Nice. For some strange reason the loop breaking delay in the end appeared when I converted the file to mp3. @BigJKO 's Cwine, also @Ben X did a couple of WJ games with it. I do *not* recommend using that in its current state. It's possible to make things with it, but it's... cumbersome! Ah, ok! Well I really liked the stuff made with it. I'll whip up something simple in gamemaker then. Good luck everyone! 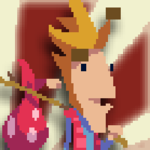 Remember to #wizardjam on twitter!